Carpet Protection will protect any carpet with ultra-tough polyethylene that grips the surface to keep all dirt and contaminates out. 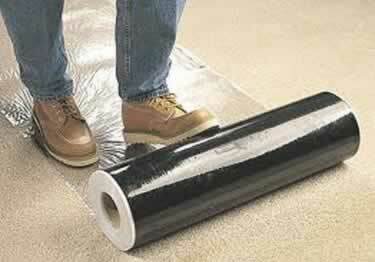 Perfect for protecting carpeted surface from paint, construction debris, or remodeling damage. Koffler's protection film offers a full 30 days of protection. Just roll it out, cut it off and you are done! Simple to use -- just roll it out and specially formulated adhesive holds it down. Reverse wound with adhesive on the outside. Lasts 30 days -- twice as long as the leading carpet protection film. Would your product stick to a rough cement floor? Thank you! Is this product appropriate to protect carpeted stairs from movers during a move-in and move-out? Could this product be cut down and placed on top of each of five carpeted steps to protect from soil and wear? I know you have a non skid product for steps but this would just be to preserve a heavily travelled spot in my split level home. How does the film stay on the carpet, especially at the edges? And can u cover a square are by placing the film one next to another? Do they stick together and not leave gaps in between for the dirt to seep in? can you tell me what the fire rating is on this product or where I can find that information. Hi, I am wondering if this is appropriate to use in a brand new leased vehicle? Would being exposed to extreme cold/heat cause the adhesive to stick to th carpet when removing it? I live in Saskatchewan, Canada!! Thanks! 1. Can I use it on wool or oriental rugs? 2. How much does the 24 X 200 weigh? It's for a tour and 50-yr-old women will be using it. Carpet Protection film will protect any carpet with ultra-tough polyethylene that grips the surface to keep all dirt and contaminates out. Perfect for protecting carpeted surface from paint, construction debris, or remodeling damage. This product did exactly as promised. Easy to install, sturdy for multiple workmen on the stairs and easy to remove. Don't really know yet - still in the box. Thank you for the review. We're always anxious to here peoples feedback on our products. Please let us know once you use the product, and if you have any questions feel free to give us a call. Material sticks and stays really well. You can sweep and even mop it to keep it looking good. When you want to protect something for more than a 10 min use - Pick this. Alexis was great and handle the problem efficiently and very professional. Wonderful to do business with this company. This film is excellent. I also have the hardwood covering . It is in the color green and wished it could be made in clear. But very happy with the carpet covering. Will buy more when this starts to run out. It works well, leaves no residue and is priced much better than at at store. It is rather hard to put on but when you get the hang of it you can do it quickly. I use it in my home in high traffic areas on carpeting that is too light. When company comes I rip it up and have a nice clean space. The order process is easy but if I have one negative about the delivery, it takes an inordinate amount of time to receive in relation to other products I buy on line. I could not find this product cheaper anywhere else then at Koffler. Some places had it at twice the cost of Koffler. The carpet film plastic works and it does not leave any sticky residue behind, I was very pleased with my purchase. Koffler Floor Protection has ultra-tough polyethylene that grips the surface & protects all types of floors for days.